Barrington Hills Village Hall is located at 112 Algonquin Road, Barrington Hills, IL 60010; phone: 847-551-3000. 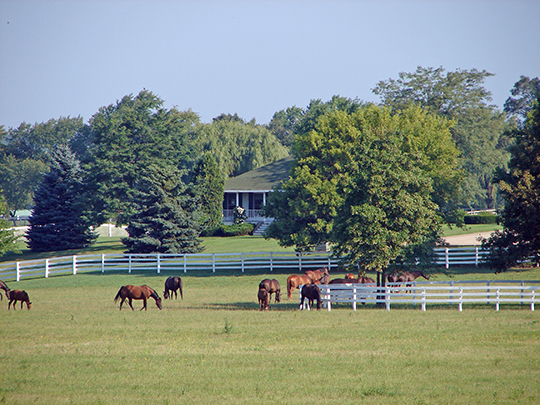 Photo: Horse Farm in Barrington Hills, IL. Photographed by User:Smallbones (own work), 2007, [cc-by-1.0 (creativecommons.org/publicdomain/zero/1.0/deed.en)], via Wikimedia Commons, accessed November, 2014. In 1833, the Indian Treaty with Chief Blackhawk was signed, and the Native Americans agreed to move across the Mississippi River. The first settlers came to this area bearing the familiar names of Miller, Otis, Bucklin, Waterman, and Jencks. Barrington Center, first called Miller's Grove, was established where Old Sutton Road crosses Dundee Road/Route 68. It was one of three small settlements which inspired what we know today as the Barrington area. Rich soils and ample water were the attractions to early migrants who settled this area for farming at the same time that closer-in suburbs such as Oak Park and Evanston were being settled for commuter residences. Since most settlers were from Vermont and Massachusetts, the familiar New England name of Barrington was chosen when it came time to organize a town government in 1850. The first schoolhouse was built at Barrington Center, followed by nearby churches in the 1850's. The Chicago & North Western Railroad (now Union Pacific) was built in 1854 and a station was located in the Village of Barrington. From this time on there were many changes in the Barrington area, but the countryside environment remained paramount. Early residents assumed the responsibility for stewardship in this portion of the area by forming the Countryside Property Owners Association in 1938. It was this group, presently known as the Barrington Countryside Association, which later provided the nucleus for the eventual incorporation of the Village of Barrington Hills in 1957. The neighboring Village of Middlebury (incorporated in 1953) was annexed to Barrington Hills in December, 1962. Today, the Village covers approximately 28 contiguous square miles in Cook, Lake, Kane, and McHenry Counties. Historic features within the Village are significant and enhance its character. Among these are the Dickinson School, the Civil War Union Cemetery, Barrington Center Church and Cemetery, the Haeger's School and Cemetery, the Cooke site (originally owned by the Helm family) which continues to yield numerous Indian artifacts, and several residences of historic value—some of which were part of the "underground railroad" during the Civil War. In the more recent past, residences of architectural merit have been constructed under the direction of such noteworthy individuals as Frank Lloyd Wright, Edward Dart, David Adler, and Robert Work. Village of Barrington Hills, Comprehensive Plan, 2005, www.barringtonhills-il.gov, accessed November, 2014.